I’ve never been sure if French Dip sandwiches are really French, or if they are named “French” Dips because they are served on crusty French rolls. I’m sure it doesn’t really matter, except for the fact that so many restaurants and fast food places serve them on soft rolls so that when you dip them, you get a soggy mess. To me, texture is just as important as flavor, especially when it comes to bread and rolls. Freshly baked bread and rolls have a special texture—crisp outer crust with a soft interior—that cannot be brought back if stored in a plastic bag. Since I have an automatic bread baker, I often use it to mix dough, setting the timer to have the dough finish just when I’m home from work or running errands; that way, all I have to do is shape the rolls, let them rise while I’m doing other things, and bake them fresh. Some grocery stores have special bins in their bakery aisles that are not as airtight as plastic bags, so their rolls keep their crisp outer texture. When making these Italian Dip sandwiches, I recommend that either you make your own rolls if you have time, or stop at the store on your way home to purchase freshly baked, crisp rolls for your sandwiches. After all, what good is “Quick Cooking” if the food isn’t good tasting and of the highest quality? My family is worth it and I’m sure yours is too! 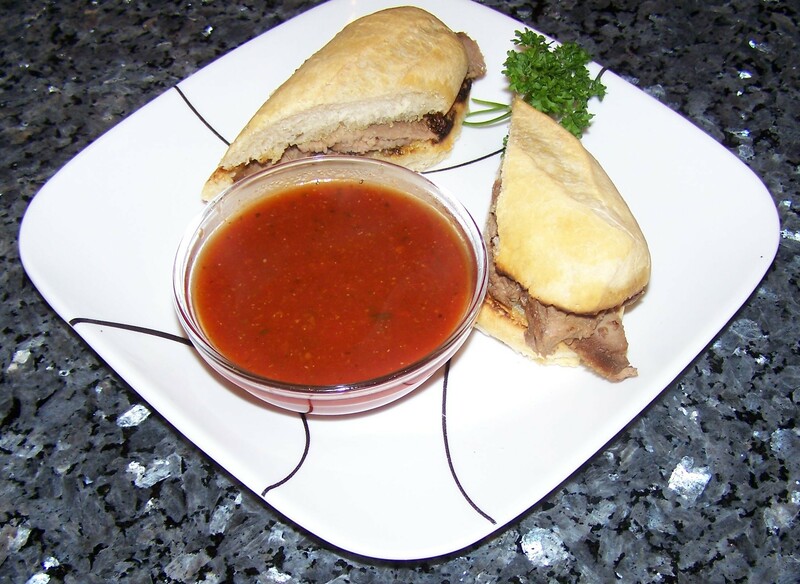 The following recipe is a take on the French Dip sandwich, but I have substituted Italian London Broil steak (recipe link at the bottom of this article) for the meat, and a rich, slightly thick dipping sauce for the au jus. When I tested this recipe on my son Mitch, who is a fast-food aficionado and extremely picky eater, he actually pronounced his sandwich “very good” which is a rare phrase coming from his mouth! Cut the rolls in half lengthwise. Rub the garlic cloves over the cut surfaces, then brush with olive oil. Place on a broiler pan and broil until crisp and brown, or grill until crisp and brown. Meanwhile, pour the beef consommé into a medium saucepan and bring to a boil. Turn the heat off and add the London Broil; pressing down so that all of the meat gets warm, but doesn't cook. When the rolls are ready, remove the meat from the consommé (drain well so you don’t get soggy rolls) and divide among the rolls. Add the prepared spaghetti sauce to the consommé and bring to a boil. Pour the sauce into individual bowls for dipping. Slice the Sandwiches in half and serve with the sauce. If you have time to make your own rolls, pour 1 ½ cups water into your auto bread baker; add 3 1/2 cups flour, 2 teaspoons salt, 1 tablespoon olive oil, and 1 tablespoon or package active dry yeast. Set the machine to dough. (As it begins to mix, check to make sure the dough is developing into a soft glob, and add a little more liquid if needed, or a little more flour if needed.) When the dough cycle is over (usually about 1 1/2 hours), remove the dough and divide into 12 pieces. Shape the pieces into rolls about 5” long and 1 1/2” wide. Place them on a parchment-lined baking sheet and let rise for about 30-45 minutes, or until double. While they are rising, preheat your oven to 425°. When they have risen double in size (poke your finger in the side of one of the rolls and if the indent stays, they are sufficiently risen), make a slit down the center of each roll with a razor blade or sharp knife, then spray liberally with water (to make steam and a crisp crust), then place in the preheated oven for 15-20 minutes or until the rolls are crisp and brown.